Flying high in Fernie, B.C. My knees tremble as I step toward the edge of the cliff – the Elk River running fast and deep way below me. I take one more look (o.k. maybe two) at the icy, blue-green waters churning below and I leap off the rocky ridge. Until our recent family trip to Fernie, I can honestly say plunging from a canyon wall into a glacier-fed river wasn’t on my bucket list. Neither, though, was whitewater rafting, fly fishing or swinging like a monkey through an aerial park. Our great Fernie adventure launched this summer in Calgary when on the eve of our trip, I was given the opportunity to test drive Toyota’s answer to a Jeep – the FJ Cruiser. Given that we were heading into the sweltering heat of a B.C. summer (with adventure travel on our agenda) and the air conditioning in my 2001 Subaru Outback is about as effective as an origami fan, I thought ‘why not’? So we packed up our newly-adopted Cruiser – a large blue beast with big fat, backcountry wheels – and our family of four hit the highway. First stop? Fernie’s Island Lake Lodge – which would serve as our base for two nights. This mountain rustic-style accommodation – comprised of three main cabins and surrounded by old growth cedar forests – is famous as a home base for world-class cat skiing during winter. But during the summer months, a nearby and intricate web of alpine hiking trails attracts a steady flow of visitors. Highlights from our Island Lake stay? Staff who consistently went the extra mile to accommodate our every need. A savoury egg, cheese and filo pastry breakfast in front of a roaring morning fire at the main lodge. And an outdoor hot tub (complete with multi-coloured disco lights) – fitting given Fernie’s reputation as the town where Hot Tub Time Machine (starring John Cusack) was filmed. 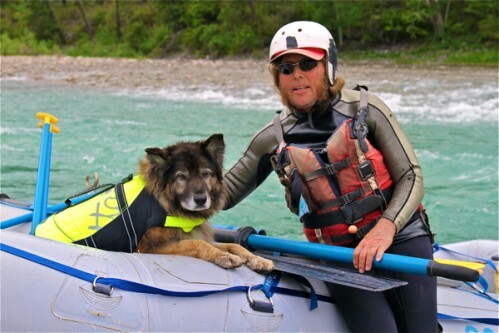 Our first adventure involved hooking up with the Canyon Raft Company – where river guide Blair Craig and his dog Kaz would lead three rafts of wetsuit-clad people down the lower Elk River. Craig was the warmest, most knowledgeble and most entertaining river guide you could ask for. The kids sported perma-grins the entire trip – even when they screamed with both terror and excitement as we powered through what felt like Hawaii Five-O-sized waves. Throw in cliff jumping and a delicious riverside picnic (fresh sandwiches and Caesar salad) and it was a pretty sweet deal overall. The day following, we met up with Beckie Clarke of Fernie Fly Fishing. Given the adrenalin-charged trip we’d just experienced, we were prepared for a quieter (and possibly less interesting?) day – also on the Elk River. We didn’t catch any fish during our fishing expedition. But the day was more about instruction than it was about hard-core fly fishing. We did, on the other hand, catch a few bushes and one stick and we did have three distinct nibbles which were quite thrilling. Our third and final night in Fernie was spent in a Snow Creek cabin – based at the bottom of the ski hill at Fernie Alpine Resort. The fully-appointed accommodation made me dream of returning during the winter. The location is unbeatable and the classic log cabin design begs to be blanketed in massive dumps of Fernie’s famous powder. Also located at the resort is the site of our final Fernie adventure: the recently-opened Aerial Playground and Rippin’ Zip Line. If whitewater rafting and cliff jumping wasn’t enough to feed our inner dare devils, then this aerial park definitely was. Not being a seasoned “extreme sports” kind of girl, I confess competent staff and quality climbing gear put me at ease. I mean, it’s not natural to leap between trees high up in the towering canopy of a rainforest. Unless, of course, you’ve been given thorough safety instruction and you’re seriously geared-up and you’re surrounded by climbing-savvy 20-somethings (from all over Canada) with reassuring teaching styles. In the end, the aerial park – impressive construction that it was – proved to be a huge hit for everyone. Not unlike what I’d imagine a miniature Outward Bound ropes course to be like, the experience pushed us physically and was a great exercise in confidence-building and family bonding. Final thoughts as we hit the road and head on out of Fernie? This little mountain ski town, flanked by the stunning Lizard Range and famous for some of the best skiing in Canada, is an awesome summer destination. We won’t be forgetting Fernie any time soon. In fact, as we blast out of town – the kids passed out in a cloud of pillows and blankets in the back seat (thanks to physical exhaustion, a smooth ride, and yes, fully functioning air conditioning!) – we’re impishly rubbing our hands together and scheming our next visit. Loaf Bakery – Huge hit with locals and weekenders who appreciate good bread & homemade pizza. Fernie Lodging Company – You can rent one of the Snow Creek cabins through these guys. Lots of more affordable accommodations available, too. Yamagoya – Amazing sushi and worth the sometimes long wait for a table. Elk River Guiding Co. – A great fly shop and guide service resource in the area. Great tips! I’m headed to Fernie next Saturday (pit stop on the way to Target) and can’t wait to dip my toes into the Elk River (I’ll leave jumping off rock faces to more adventurous gals).